FILE - Russian S-400 air defense missiles are being deployed at Hemeimeem air base in Syria, Nov. 27, 2015. Turkey has placed an order with Moscow for several such systems in a deal valued at $2.4 billion. Turkey's President Recep Tayyip Erdogan says Ankara has agreed to purchase Russia’s S-400 missile systems, despite NATO concerns. The controversial purchase comes as Ankara tries to court Moscow, after a Turkish jet downed a Russian bomber operating from Syria in 2015. "We have now taken steps with Russia about this issue [buying S-400 systems]. Deals have been inked," Erdogan announced Tuesday to his parliamentary deputies. "In God's will, we will see S-400 missiles in our country and precede the process with joint production." The Turkish president did not miss an opportunity to dismiss concerns of his NATO partners. "Why will it cause tension? A country should be in search for the ideal ways for its own security," he said. Ankara is at loggerheads with its Western allies over their support for Syrian Kurdish groups fighting Islamic State militants, the former considered to be terrorists by Turkey, along with growing criticism over human rights. 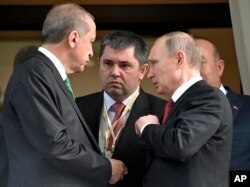 Ankara’s NATO partners have voiced concern about the compatibility of the Russian system with its technology, along with fears that Moscow could use the S-400 as a Trojan horse to compromise NATO systems. The controversy will only add to growing questions over Ankara’s allegiances. The Pentagon weighed in, telling VOA that the United States has "an open dialog" with Turkey on the issue. Spokesman Johnny Michael told VOA on Wednesday: "We have concerns about the purchasing of the S-400 systems, which we have relayed to the government of Turkey." Michael said the United States emphasizes the importance of remaining compatible with the NATO system on any major defense system procurements. But he noted that "the United States and Turkey have a robust and significant defense trade and military sales relationship" and said the U.S. "is committed to expediting the delivery of equipment purchased by Turkey, when possible." Ankara insists the missile system, which is acknowledged as being one of most effective on the market, offers the best value for its money. The deal, worth $2.4 billion, is bolstered by Russia’s commitment to transfer technology, which also is a Turkish government priority. FILE - Turkish President Recep Tayyip Erdogan, left, speaks to Russian President Vladimir Putin, right, as he leaves after their meeting in Putin's residence in the Russian Black Sea resort of Sochi, Russia, Wednesday, May 3, 2017. There may be more than defense considerations, though, behind the missile purchase. Ankara is trying to persuade Moscow to end all of the economic sanctions imposed after the Turkish jet downed the Russian bomber. Some of those sanctions have been scaled back following a succession of meetings between Erdogan and Russian counterpart Vladimir Putin. Russia has lifted an embargo pertaining to the import of some Turkish goods and has ended a ban on Russian tourists visiting Turkey, which had devastated Turkey’s lucrative tourism industry. But Moscow is extracting a heavy price from Ankara. Russia was once Turkey’s biggest export market for tomatoes, with the trade valued at $250 million annually. During Erdogan’s March meeting with Putin, the Turkish president reportedly lobbied hard for an end to the tomato ban, to no avail. But a breakthrough may be in the offing. On the same day Erdogan announced the decision to buy the S-400, Russian Deputy Prime Minister Arkady Dvorkovich announced negotiations on the tomato ban would resume August 18. But Moscow’s reluctance to make speedy concessions offers an insight into the wider nature of bilateral relations. With multiple outstanding differences between Moscow and Ankara — in particular over Syria, with the two nations backing rival sides in the civil war — and Russia's support for Syrian Kurdish rebels that Ankara calls terrorists, the possibility of a re-emergence of tensions remains. VOA Pentagon correspondent Carla Babb contributed to this story.